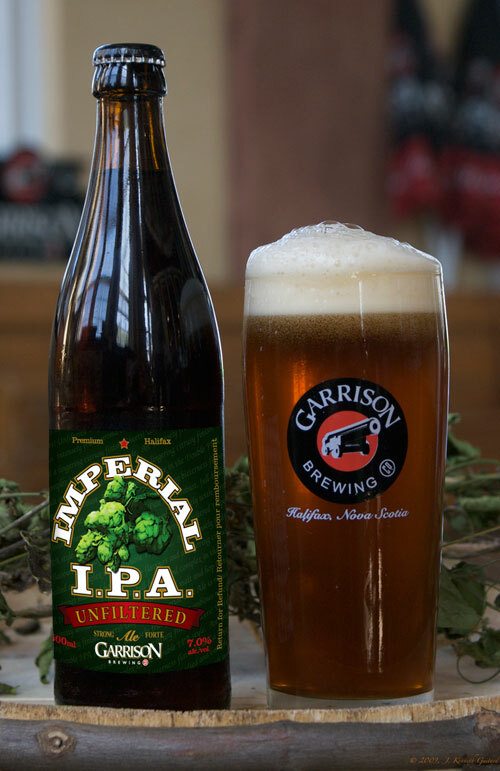 For those who have been following the Free Our Beer project, you know that Garrison Imperial IPA was accepted into the LCBO’s upcoming Autumn seasonal release program at the beginning of the year. Well, it’s about to finally hit the shelves! It’s been a long road to get here – from the initial submission, to the required paperwork, label re-designs and package analysis, but we made it. On Friday the LCBO held a media tasting for the Autumn and Halloween beer releases, and there was Garrison IIPA, alongside all the other fine beers coming to the shelves. This release is significant as it’s representative of our goals to help bring better beer to Ontario, while at the same time being able to inform the citizens of the province about how the LCBO processes work. But all that aside, it’s a fantastic beer and one that we feel beer drinkers will really enjoy. Not to be self-serving, but if you like the Garrison IIPA – please buy it! The LCBO takes into consideration when making their beer purchasing decisions how a beer sells – they are a business after all. And as the LCBO mentioned to me earlier – future decisions about Garrison beers will be affected by how IIPA performs at retail. Side note: the LCBO has already rejected Garrison’s Hop Yard Pale Ale, presumably (in part) due to the same rationale. So if you want to see more Garrison beers in Ontario, get yourself a handful of bottles when you see them! Garrison IIPA will be part of the Autumn seasonal release which officially begins hitting LCBO shelves on Monday, September 13th. You can use LCBO.com to help find which stores will be carrying it. Garrison IIPA will be available in single 500mL bottles for $4.25 each. LCBO Pre-Selection Process – They Don’t Want to Taste? 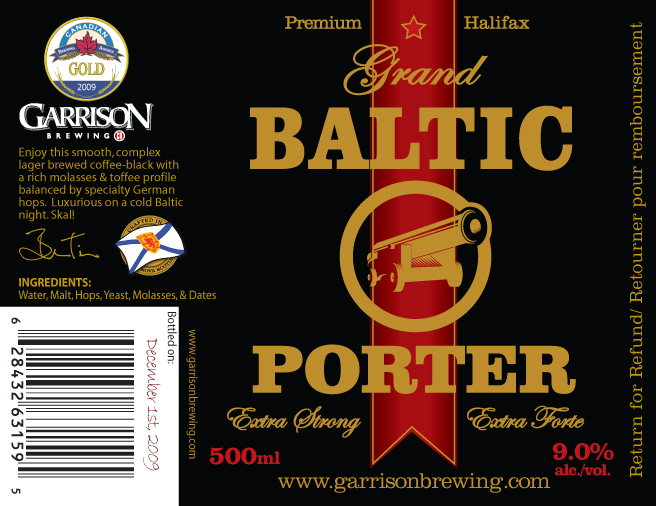 The LCBO seasonal product call process has been documented numerous times at Free Our Beer – we have been successful with Garrison’s submission into the Autumn 2010 release but unsuccessful with the Winter Warmers release. The basic process was pretty straightforward. An agent or brewery would submit to the LCBO beers for consideration along with the appropriate supporting details (marketing plan, pricing, case/shipping information, etc.). The LCBO would then taste the beers, make their selections for the releases and a new process would start for getting product onto shelves. At the end of June this year, this process changed slightly, and it’s a bit concerning. In a letter to the trade, the LCBO has added a first step to the process in advance of the tasting. But what’s really happened is they have split the submission of the supporting details (marketing plan, etc.) and the beer itself. The process now is that the LCBO is first asking for “a photo of the product and packaging as well as relevant product and marketing information” but no beer samples at this stage. As the letter goes on to state, “products selected to move forward to tasting will be accepted” and “all other products declined”. Only at this point, once the submitted beer(s) have been accepted, will they actually be tasted for final decision if they are to come to stores. What makes this strange is that the LCBO seemingly will be making a first cut of decisions without actually tasting any beer. So, it would seem that beers will be evaluated on attributes but not what the beer tastes like! I can understand how pricing, packaging appeal and intended marketing spend are important variables in the business of beer sales. But considering that the seasonal beer program generally focuses on specialty beers, is not how they taste an important and critical consideration? As this changed process has just been implemented, I cannot determine what percentage of submitted beers will be accepted for tasting based upon the initial submission. But on the surface it seems like the LCBO has implemented it to save themselves the hassle of tasting – after all, there were over 80 products submitted for tasting in the Winter Warmers release. I for one would love to taste all those beers before deciding what comes to stores. But it would seem that in the future beers with pretty packaging, a strong marketing spend and the right retail price will get preference over what actually tastes good. We will have to wait and see if this is the case. Free Our Beer and The Bar Towel are hitting the road tomorrow evening to travel down to the Craft Brewers Conference in Chicago. The conference, organized by the US-based Brewers Association, is one of the largest of its kind, attracting over 2,600 industry professionals according to the web site. It has been sold out for some time now. Why are we going down to the conference? For one, it looks like a crazy city-wide beer extravaganza, with multiple beer related events happening both at the conference and at local bars and breweries. But the main reason is to gather knowledge about the craft beer industry in the United States to continue to help the Free Our Beer project provide consumers in Ontario with how our system does not serve the best interests of beer lovers here. Looking at some of the special events, a number of bars are bringing in special beers that they will tap throughout the week to commemorate the occasion. For example, the Hopleaf will have different draughts from craft breweries in California, New York, Maine, Michigan and Colorado, with possibly others. The Local Option will have about five different draught brands from Cantillion, six from Dieu du Ciel and sixteen from Mikkeller along with some US brands. Many other pubs, restaurants and beer stores are holding various tastings, tappings and meet-and-greets with breweries and beers. This is fantastic to look forward to, but as Free Our Beer we must note that this kind of thing could never realistically happen here. The number of international beers and out-of-state beers that are coming into Illinois to be a part of the conference is staggering. With our system in Ontario, this kind of flow of beers into the province for an event would never occur. There’s just too many hurdles and roadblocks. Here’s another big one. Stone Brewing recently announced a distribution deal to enter the Illinois market, and to celebrate they organized a week of events, including multiple draughts and bottles available at different spots around the region. Talk about entering the market in a big way. In comparison, Garrison is also entering the Ontario market with a single beer coming as a one-time release at the LCBO in September. Hopefully there will be more brands to come, but that will not be until 2011. Keep an eye on Free Our Beer for more from the Craft Brewers Conference in the coming days. You can also follow Bar Towel on Twitter to stay connected to what’s happening at the conference. The latest private order for Garrison Brewing, many months in the works and not without a few hiccups, finally made it to Ontario at the end of March. This order was different from the last one as it also featured a couple of licensees getting in on the action, with Bar Volo in Toronto and Chancey Smith’s in London taking some to serve at their fine establishments. Bar Volo launched a new beer menu at the end of March featuring both the Garrison Imperial IPA and Hopyard Pale Ale. Private ordering continues to be both a blessing and a curse. On the positive side, it is the a valuable method by which beers regularly unavailable in Ontario can be brought in for beer lovers in the province to enjoy. However, the steps involved, paperwork and consumption of time makes the process very arduous. It took over 7 months from the time the order was announced to the beer arriving. There was certainly a lot that happened over that period, and looking back efficiencies can be found, but it is a very time consuming process. But the beer made it to the hands of beer lovers in Ontario, so let’s raise a glass and enjoy. For those that don’t know, the LCBO makes their decisions for what beers come out in stores quite a long time in advance. It is released publicly what they are looking for – the LCBO calls them “Product Needs” (PDF) and issues to the trade what beers they would like to release basically a year in advance. It is then up to the agents and breweries to decide what they would like to submit for LCBO consideration. If the LCBO deems the beers a match to what they are looking for, it comes out in stores. This is the basic way the LCBO seasonal beer releases are decided, along with other products (not just beers). This past October was the deadline for the Autumn Ales seasonal release, which will hit the store shelves in September 2010. The release called for “Products appropriate for Autumn (i.e. Belgian & English styles, Stouts, Porters, Oak aged beers)”. It also asked for “Single serving format preferred (500 mL)”, a “Proven track record in other markets” and even “award winning”. Well, I thought to myself, Garrison Imperial I.P.A. (which it is now known) would make a good fit for this! So in conjunction with Brian at Garrison, we completed the LCBO’s requirements for submission – marketing plan, product samples and some pricing and packaging information – and brought everything over to the LCBO for them to mull over. The Garrison Order – What Happened Next? OK, it’s been a few months since my last post about the Garrison private order, when I explained the letterhead issue and how that needed to be resolved to keep the process going. But what happened after that? As you’ve seen from the recent posts the beer did in fact make it to Ontario and into the hands of our consumers. The truth is, I didn’t want to jeopardize anything by highlighting too much while the order was taking place. I kept my customers in mind – they were the ones who made this order possible and I didn’t want to have any extra delays with the order. But it’s here now so let’s talk about what happened after we got the letterhead issue sorted out. First, here’s a funny story about what happened after I submitted the paperwork, letterhead issue aside. As I’ve mentioned in previous posts, the order documentation I needed to submit was 104 pages. This was a massive PDF that was about 15 megabytes. In order to process the order, I obviously needed to get the PDF to the LCBO. Due to the sensitive nature of the document (it contained customers’ credit card information for a deposit), I wanted to be as secure as possible with the document itself. I password-protected the PDF and e-mailed it to the LCBO’s order request e-mail address. Shouldn’t be a problem, I thought, except the e-mail bounced – the address could not accept an attachment that large. OK, on to another method. I’m generally a tech-savvy person and didn’t want to resort to printing for mailing or faxing. Not only would that be wasteful of all the paper but time-consuming as well. So I put the document onto a web site address where the LCBO could directly download the file from a link. And to be extra secure, I put another password to access the link. Again, I was doing this for the security of my customers’ personal data. One password to access the file and another one to open the document I believed was reasonable, or so I thought. It wasn’t. After I submitted the file to the LCBO, I received a curious e-mail from the private ordering department asking me to in the future, submit orders via mail, fax or e-mail. I responded by saying that I did in fact submit it via e-mail. I received another e-mail back telling me that the way in which I submitted the order (web download) was “encumbersome [sic] and very time consuming process” and that “for efficiencies” orders should be submitted via mail, fax or e-mail. I was quite upset about this. Here I was trying to protect the personal data of my customers and the LCBO gives me grief? Now this is clearly a case of a regular process being the way that the LCBO is used to and even the slightest variance raises a red flag. But what does this say about the mentality of the LCBO when having to take an extra step to ensure the protection of customer credit card information is seen as an inconvenience? I responded back to the LCBO explaining that I did originally attempt to e-mail the document but the mail servers wouldn’t accept the attachment and they might want to look into that. I continued to explain that the password layers were intended for customer protection and that should be something they could understand. I didn’t hear back from them about the issue. I did receive an e-mail later on from the LCBO telling all agents that they would no longer be requiring credit card information on the private order documentation. I guess I won’t need as many passwords for the next order.